One day, Mr. Big comes and tells me he's scored a reservation at the hot new restaurant, Ichnusa Botega & Bistro, in Malá Strana. "But you can't write about it," he adds. "It's supposed to be small, and I don't want you to make it impossible to get a reservation." "It already got a rave, four-stars across the board review in The Prague Post," I told him. His shoulders sank, and I received dispensation to write it up. We brought along a colleague, Moscow Man. The place is small, indeed. There are only five tables. I usually try my best to avoid invading other people's privacy with my pictures and, since it was such close quarters, I blurred the faces in the photos. 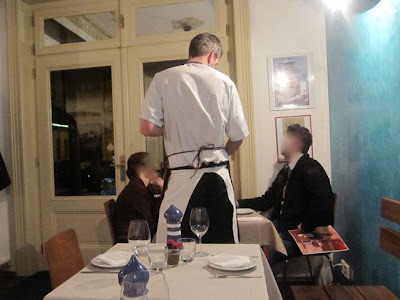 The chef acts as a waiter, flitting back and forth from the kitchen to take orders. There was no menu. He just told us in his terse, laconic style what was on offer. And it's not like he recited a long list. He just deadpans something like, "I can make a plate for the table with prosciutto. Cheese." Then he stops. If you press him for more options, he might offer sun-dried tomatoes, artichokes and mushrooms. So that's how we started off. The varieties of rough-cut, dry-cured hams were delicious. The aged Pecorinos and goat cheese were also great. 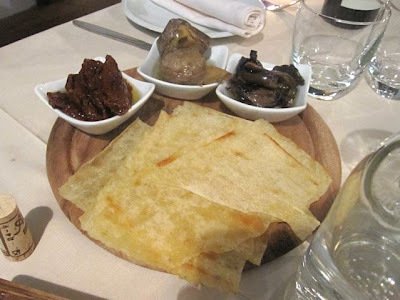 These came with Sardinian flat bread called pane carasau. It tasted a bit like bread sticks. The bill wasn't itemized very specifically, but these starters added up to around 300 CZK for the three of us. We later ordered more cheese and regular bread for 100 CZK. One of the very nice touches is we also received carafes of tap water, without having to get the expensive bottled stuff. Speaking of bottled stuff, the wine list was very pleasurable reading. It wasn't a long document, but the Italian wines were priced in my sweet spot, the 400-600 CZK range. V said the wine list at Osteria da Clara is only a little bit better and cheaper. 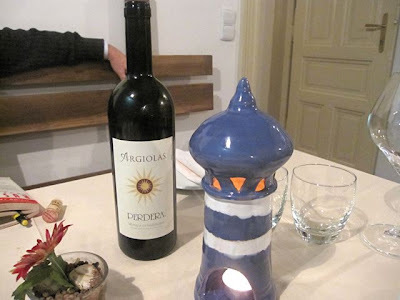 We started off with two bottles of the Argiolas Perdera from Sardinia (349 CZK). It was simple and dry, but nothing special. Then, we were offered either a ravioli with ricotta and spinach or an Italian specialty of dried, cured fish eggs, also known as bottarga. The chef sold it to us saying that we could get ravioli anywhere, but this was the only place to get such fish eggs. The dish was very salty and naturally fishy. The sliced pieces were quite tasty when placed on the pane carasau and then drenched in lemon juice. After this, we all had a salad with grilled calamari and a shrimp (130 CZK). 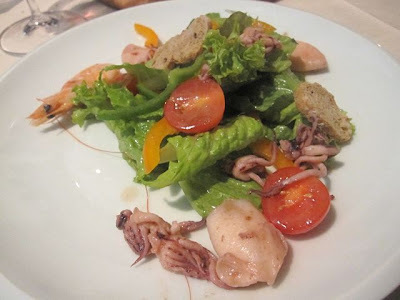 The warm squid was fresh and tender, the shrimp was small and nothing special. The dressing was very basic. 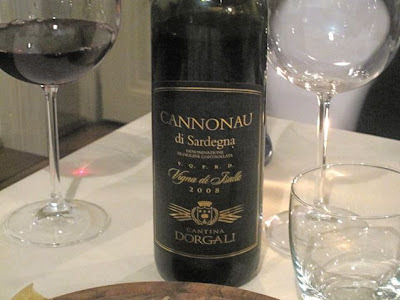 After killing off the first two bottles of wine, we ordered two bottles of a Cannonau di Sardegna (313 CZK). There were several Cannonaus on the menu. Despite the cheaper price, we all enjoyed this smoother, less tannic wine more than the Argiolas Perdera. 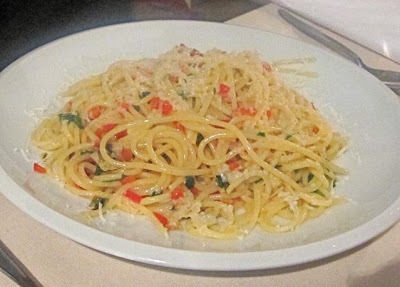 Jersey Girl joined us at this point and since she's mostly vegetarian, the chef made her a simple pasta with olive oil, red peppers, and grated cheese (155 CZK). It was fresh and simple, but on the salty side so it didn't draw a rave. Jersey Girl doesn't impress easily. 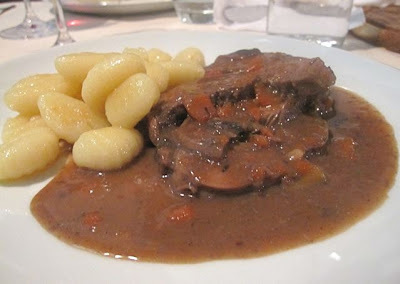 For the men's main courses, we all had the wild boar with gnocchi (315 CZK). I didn't find the meat or the gnocchi to be particularly noteworthy. But the sauce was special. The rich salty gravy also had a fruity sweetness that had me asking the chef what it was. After struggling a bit with the translation, it turned out to be myrtle. He even brought out some dried myrtle berries for us to try. 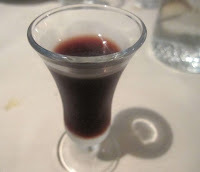 At the end of the meal, we all had a shot of Mirta, a liqueur made from the Myrtle berries (40 CZK). I liked it very much. Because the service was partly handled by the chef, it did go in fits and starts. There were long stretches between courses. The whole thing took about three hours. But because the conversation was good and the wine flowed freely, we didn't really care. We were in no hurry. We ended up paying about 1000 CZK each, which seemed like a lot, at first. But then I remembered I had had more than a bottle of wine just for myself, and considering the several courses, it seemed quite fair. I went back with V a few weeks later. The chef took our orders, but we were also waited on by a nice Moravian boy (V usually loves Moravians), and an Italian man who appeared to be the owner. 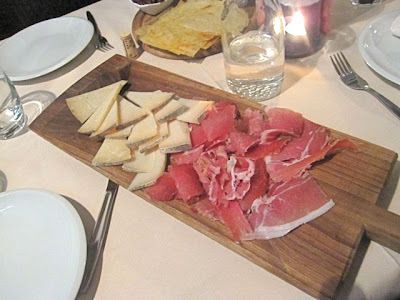 We started again with the cutting board of cheeses and cured meats (300 CZK). I particularly liked the 12-month old, sharp and tangy Pecorino on this platter. 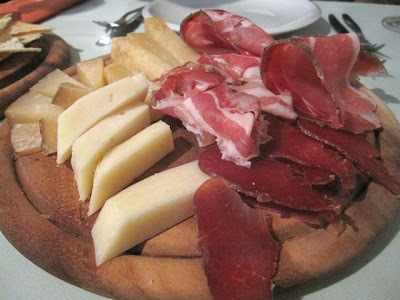 It also came with silky pancetta and cinghiale or wild boar, which V liked the best. With the intense saltiness, it was a lot to eat for two people. 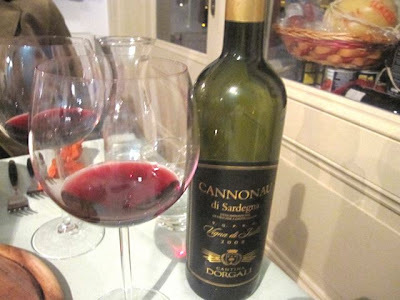 We ordered a bottle of the same Cannonau di Sardegna, which V said was fine, but she didn't love. For some reason, I remembered it tasting better on the previous visit. Also, when our Italian host poured the wine, he wiped drops from the top of the bottle with his index finger. Twice. 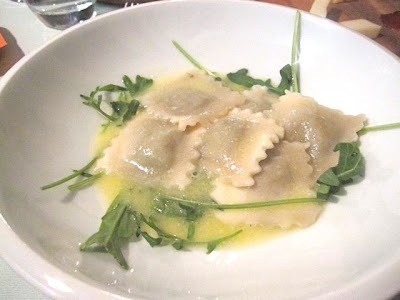 For a starter, I had the rucola ravioli. It was very fresh, but the flavor didn't grab me so much. The filling tasted more of flour than of rucola. The pasta sat in a sauce that tasted like pure, melted butter. V had the fish soup. 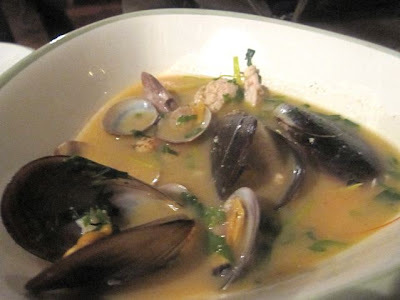 The broth tasted of the sea, but was rather thin. 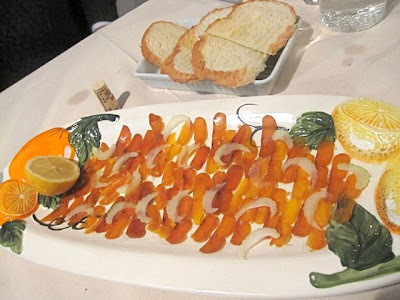 V said the best part was the dollops of fish roe. Otherwise, she said it was uninspired, and she recalled some better versions she's had in the past. 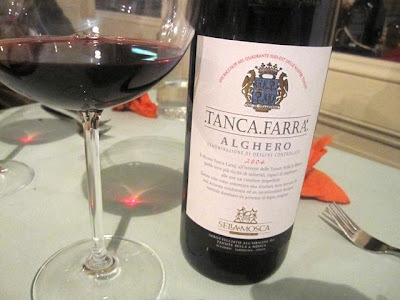 We ordered a second bottle of wine based on our Italian host's recommendation -- the 2004 Tanca Farra (583 CZK). He even let us try it before ordering. This wine cost more, but the more complex and satisfying wine was worth the extra money. Also, I saw it for €10.50 online, so the mark-up wasn't too bad. The prices of the two starters were 130 CZK and 145 CZK, but I couldn't tell which was which. 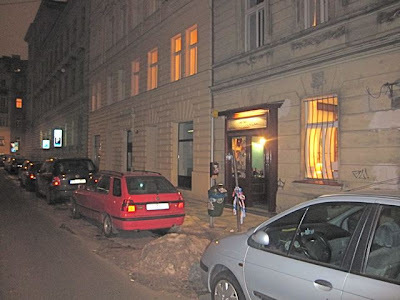 The main courses were 355 CZK and 395 CZK. 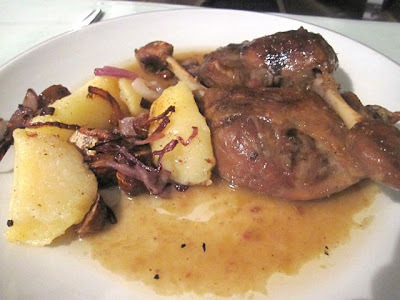 V went for the duck leg confit. After she ordered it, the chef came over, saying that he had very fresh duck breasts that he wanted to use, it she'd change her order. She stuck with her legs, but in retrospect, she should have switched. She said the leg tasted like a very ordinary baked Czech duck. It was tender, but there was not much more to it than a strong, gamey flavor. Essentially, it was boring. I had more luck with the Argentinean steak. It was thick and tender, with a slathering of balsamic vinegar syrup that gave it a tart-sweet coating. 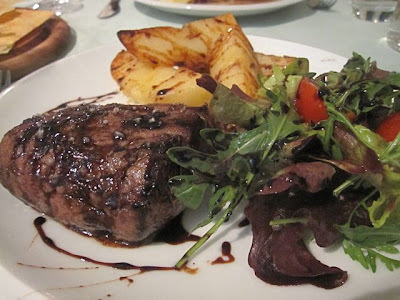 I did ask for it to be cooked medium rare and it came out very rare, but I was not too bothered about that. The simple salad and potato wedges drizzled with the balsamic were fine. 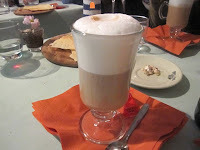 I had a coffee (42 CZK), but we didn't feel like dessert. The meal was another three hour affair. The second trip was 2315 CZK for two, not including tip. But again, the wine boosted the price. 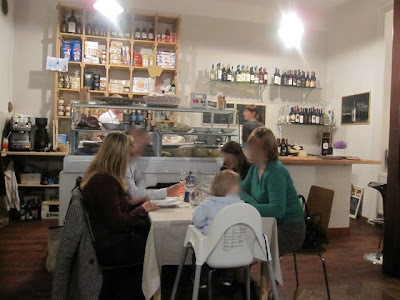 We talked about the dinner afterwards, and both of us felt the food was simple, fresh, but with a few exceptions, it didn't bring enough smiles or wishes for more. Sometimes it was a little too ordinary. What we both liked more than the food itself was the overall experience. There's nothing quite like it in Prague. We felt like we were eating in someone's bright kitchen in Italy. It had a very personal feeling, and the good, decently-priced wines helped us warm up and feel a part of it. Mr. Big liked Ichnusa more than us and said he'd be going back from time to time. For V and I, neither of us felt a big desire to make Ichnusa a regular part of our dining routine. However, we were both glad we tried it and would tell other foodie friends with three hours to spare to give it a shot. But getting one of the few tables at Ichnusa was not so easy. And despite my lack of a rave review, it might still be too crowded.